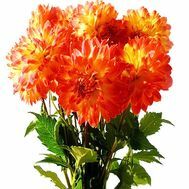 A bouquet of dahlias is a perfect gift, which carries solar energy and beauty. 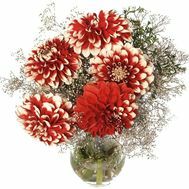 A beautiful bouquet of dahlias at all times was considered a charming and desirable gift. With this flower is associated with a beautiful legend, saying that the young man George, who was in love, kidnapped him from the royal gardens to give to his beloved. Therefore now bouquets from this flower are given, basically, to people close and hotly desired, so an additional gift, and as the main. 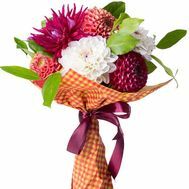 You can buy a bouquet from dahlias for your sister's birthday, having pleased with a magnificent and bright gift. 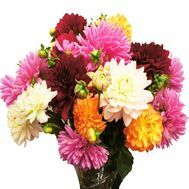 But if you want to impress your girlfriend on the anniversary of relations - give a bouquet with dahlias of any shades. The beauty and majesty of this flower will say it all for you, because its appearance and fragrant aroma charm far better than all the words about love. 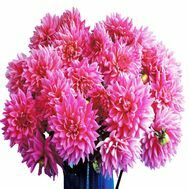 Dahlias are a whim of nature, and a favorite gift for all women that can melt the ice in their hearts and conquer even the most impregnable. 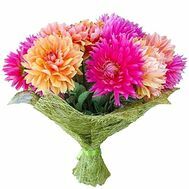 Where is the most advantageous to buy flowers with delivery? Customer orientation: with the feedback of our customers you can always read on the site, as well as become a part of our big and happy family. Prices in our store do not bite, and the abundance of stocks and discounts will delight you!